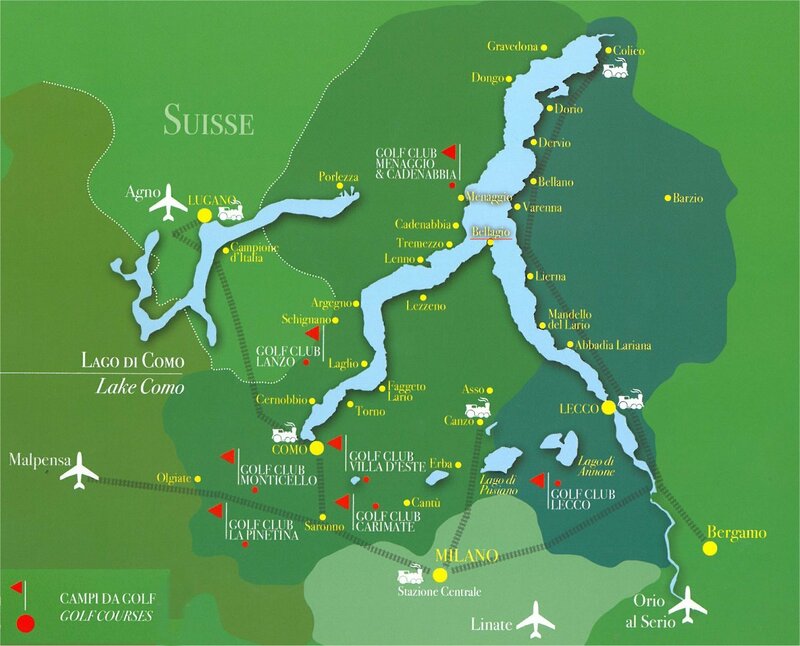 The area of Lake Como is enriched by 7 prestigious Golf Clubs. Here below a short description of the greens. Most of them are private; at their discretion non-members are allowed to play. Booking is necessary, an appropriate attire is required and at weekends/holidays or during competitions are open only to members. The Menaggio&Cadenabbia Golf Club was founded in the early 20th century on the hills of Menaggio. This is a distinctive alpine hills course (18 holes, 5482 mt, par 70, altitude 455mt s.l.) Its difficulties are determinate by narrow and winding fairways and the steep inclines. Open every day from March to November, from 08:30 to 18:00. It is situated in the heart of Brianza, between two lakes, Annone and Pusiano. The course (18 holes, 5672mt, par 71) is plain with some narrow holes with dogleg in a thick wood and some long ones wider with less vegetation. It is a technical path. Open all year around, from 08:30 to 19:00. Closed on Tuesdays. The Villa d’Este Golf Club is set in the hills overlooking the lake of Montorfano. It was founded in 1926 and it is surrounded by a magnificent wood of more than 30.000 chestnut, pine and birch trees. The course (18 holes, 5732 mt, par 69) is open from March to December, from 08:30 to 19:00. Closed on Tuesdays. The Monticello Golf Club was founded in 1974 on about 140 hectares. It has hosted 7 Italian Opens and with its two courses is the largest in Italy. The red course (18 holes, 6270mt, par 72) and the blue one (shorter but not less challenging – 18 holes, 5904mt, par 72) lie in a marvellous setting with 2 artificial lakes. It is open from February to December from 08:30 to 18:30. Closed on Mondays. The Golf Club Carimate was founded in 1961 on 60 hectares of the century-old park of the castle of Carimate. It’s a varied course (18 holes, 6021 mt, par 71) with broad, well-lit fairways in a hilly setting. The first 9 holes are a bit steeper. Open all year around from 8:30 to 18:30. Closed on Mondays. via Al Golf 4, 22070 Appiano Gentile (CO) Tel. 031/933202. The Pinetina Golf Club stretches over 70 hectares of magnificent countryside and is set within the Appiano Gentile and Tradate park with its pine, larch, oak and chestnut trees. The course (18 holes, 5528mt, par 70) winds over rolling terrain and offers a variety of challenging holes with magnificent panoramic views: Monte Rosa and the Lombardy Pre-Alps. Open all year around from 8:30 to 18:30. Closed on Tuesdays. Piano delle Noci, 22024 Lanzo Intelvi (CO). Tel. 031 839060. The Golf Club Lanzo was founded in 1962 by the great architect Donald Harradine. The 9 holes course (double departures, 5094mt, par 68) is located at the height of 1000mt and wind across the woods of Piano delle Noci with view of the surrounding valleys and mountains. Open from March to mid-November. Closed on Mondays.